Spanish courses, volunteering, internships and travel around Ecuador . . .
Volunteer with children, teaching, environmental projects, animal rescue, and more. 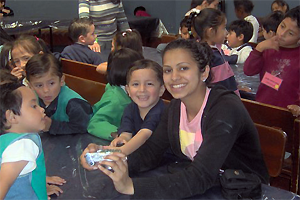 Volunteering and internships in hospitals, clinics and health-care centers around Ecuador. Community and grass-roots projects in the Amazon, the Andes, the Pacific coast and the Galapagos Islands. 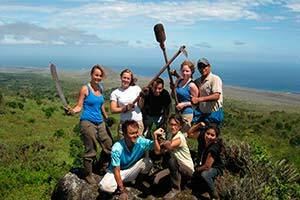 Short-term Study Abroad, Service Learning and Volunteering programs in Ecuador – academic and experiential, faculty-led and hosted itineraries exploring social, cultural, environmental themes and sustainable development. Yanapuma collaborates with grass-roots organizations and local communities all around Ecuador to offer reliable and rewarding service work. Our friendly volunteer coordinators are always on hand to advise and support you throughout the process. Learn more . . . . . .
You can volunteer with animal rescue centers, childcare and education, clinics and health centers, conservation and sustainable farming, street children, adults and children with learning difficulties, the homeless aged and more. Click here to see them all! Yanapuma works with indigenous and marginalized communities around Ecuador as well as collaborating with local grass-roots organizations to offer service learning, study abroad and global citizenship programs for international students in a wide variety of disciplines. Yanapuma Foundation is an Ecuadorian non-profit NGO, dedicated to promoting sustainable development in indigenous and marginalized communities. We operate on a "social enterprise" model, part funding our work through income generated from our own activities. .
Learning Spanish is vital to being able to communicate effectively with your hosts, and taking Spanish classes in Quito or Cuenca with Yanapuma while you volunteer offers the perfect combination of study and practice to develop your Spanish language skills! Here are some of our most popular volunteer destinations in Ecuador for our international volunteers.